The Quality Payment Program (QPP) falls under the Medicare Access and CHIP Reauthorization Act of 2015 (MACRA). It is a value-based program that determines reimbursement for clinicians treating Medicare patients. The Centers for Medicare and Medicaid Services (CMS) recently released the final rule outlining the Quality Payment Program (QPP) for 2019. Keep reading to learn how the changes could affect you, and how SurveyVitals can help your organization meet reporting requirements. Be the first to know! Join our MIPS mailing list. Two Tracks: Which is right for you? The MIPS Track How do I avoid a negative payment adjustment? Individual vs. Group Reporting Selecting and Reporting Measures Quality Category Improvement Activities Promoting Interoperability Special Status Anesthesia QCDR Reporting What are the current MIPS deadlines? How is MIPS different in 2019? Does SurveyVitals administer CAHPS for MIPS? Interested in meeting measures with SurveyVitals? 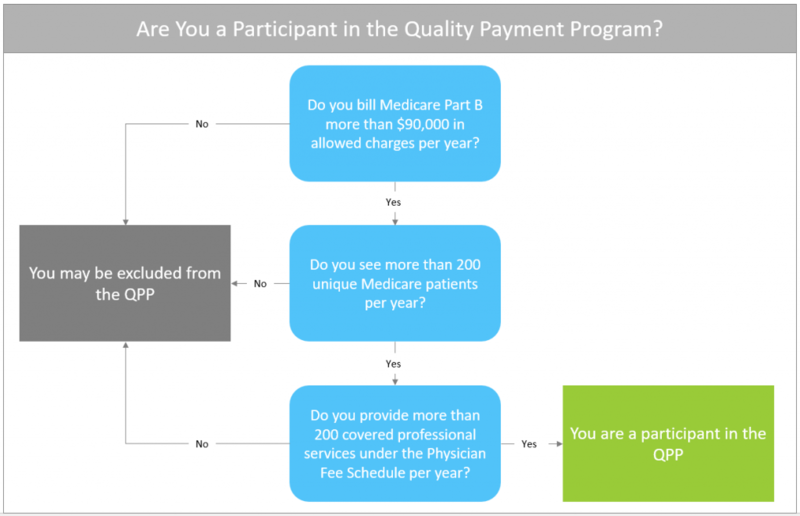 If you bill Medicare Part B more than $90,000 in allowed charges per year and provide over 200 covered professional services under the Physician Fee Schedule for more than 200 unique Medicare patients a year, then you are part of the QPP. If you do not meet all three criteria, you could be exempt from participating in the program in 2019 under the the low-volume threshold exemption. Beginning in 2019, clinicians who meet the low-volume threshold may still opt in to MIPS if they meet at least one criterion. If you are unsure if you are required to participate in MIPS, CMS has provided a resource to check your status by entering your NPI into an eligibility “calculator.” Additionally, the agency plans to send letters to clinicians notifying them of their eligibility in 2019. Two Tracks: Which is right for you? There are two participation tracks in the Quality Payment Program. Most Medicare Part B clinicians and groups will fall under the Merit Incentive Payment System (MIPS) track, while a smaller percentage will qualify to participate in the Advanced Alternative Payment Models (APM) track if considered an “advanced APM.” It is important to note that those APM models which are not considered “advanced” by CMS will still participate in the MIPS track. Learn more about APMs here. How do I avoid a negative payment adjustment? 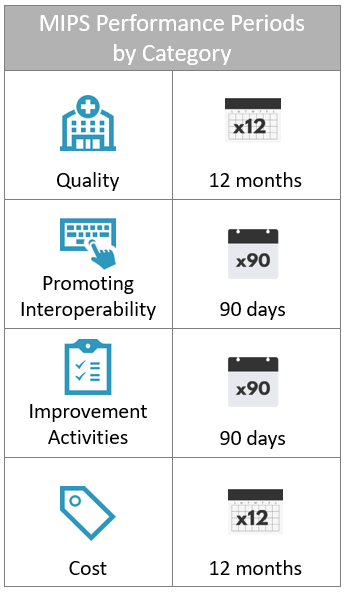 For the 2019 performance year, CMS extended a portion of the “pick your pace” program, allowing clinicians to submit just 90 consecutive days of performance data for the required measures in the Improvement Activities and Promoting Interoperability categories. However, clinicians will need to report data on all required measures in the Quality category for the full performance year (12 months). CMS will also score and measure the Cost category for the full 12 month period as well. Since CMS gathers the Cost category information through Medicare claims data, no additional submission mechanism is required. 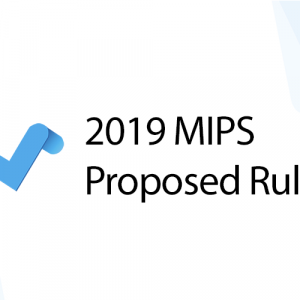 If you do not participate in MIPS in 2019 you could be faced with a 7% penalty. Eligible clinicians have the option to report as an individual, within a group, or within a virtual group. An individual is a single National Provider Identifier, or NPI, tied to a single Taxpayer Identification Number, or TIN. A group is a single TIN with two or more eligible clinicians (including at least one MIPS eligible clinician), as identified by their NPIs, who have reassigned their Medicare billing rights to the TIN. Participants are scored as a group and receive one payment adjustment based on aggregate performance. A virtual group is a combination of two or more TINs assigned to one or more solo practitioners or one or more groups consisting of ten or fewer eligible clinicians that elect to form a virtual group for a performance period for a year. There is currently no limit on the number of TINs that can participate in a virtual group. Virtual Groups bring additional flexibility to the program, allowing clinicians to participate in MIPS with their peers, regardless of their geographical proximity or specialty. 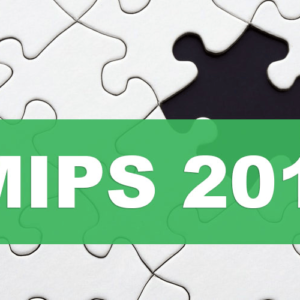 Those wishing to participate in a MIPS Virtual Group must make a formal election with CMS by December 31, 2018. Data for participants can be reported by various submission types by an individual or group as applicable. Alternatively, data may be reported by a Third Party Intermediary that submits data on measures and activities on behalf of a MIPS eligible clinician or group. The aim of the MIPS program is to provide clinicians and groups with the flexibility to select measures that best suit their practice. For the Quality category, participants can choose from several types of measures, which vary based on whether they are reporting as individuals or as part of a group. Submission methods are dependent on the types of measures chosen. For the Improvement Activities and Promoting Interoperability categories, participants choose their measures from the QPP website. There are three submission methods for these measures. Direct: Users transmit data through a computer-to-computer interaction such as an API. Log-in and upload: Users log in with a set of authenticated credentials and upload and submit data in a CMS-specified format. Log-in and attest: Users log in with a set of authenticated credentials and manually attest that certain measures and activities were performed. Eligible clinicians are required to report six measures of their choosing for the Quality category. One of those measures must be an outcome measure. If no outcome measure is available, a ‘high priority’ measure must be reported in its place. High priority measures are contained in the following domains: outcome, appropriate use, patient safety, efficiency, patient experience, efficiency, and care coordination. What are specialty measurement sets? CMS developed specialty measure sets as a part of the available MIPS measures in the Quality Category. Participating clinicians must choose six measures to report within their specialty set. If there are fewer than six Quality measures to choose from in a specialty set, the clinician or group must complete all available measures contained in the set. SurveyVitals can help anesthesia clients who utilize a Qualified Clinical Data Registry (QCDR) meet a measure–AQI 48 (anesthesia patient experience)–in the Quality performance category. Learn more here. The IA category requires clinicians to participate in a combination of measures totaling 40 points to fully satisfy reporting requirements. Activities weighted “high” are worth 20 points, while “medium” weighted activities are valued at ten points. Clinicians and groups considered non-patient facing, and practices with 15 or fewer eligible providers and/or clinicians practicing in rural and health professional shortage areas, may face reduced reporting requirements. Learn more about these special exemption statuses here. Your SurveyVitals solution can help you satisfy measures in the IA category. Download our “Road-Map to Improvement Activities” or contact us at info@surveyvitals.com to learn more. The Promoting Interoperability category places an emphasis on interoperability and patient engagement with certified EHR technology. Eligible clinicians must report on certain measures from four ‘objectives,’ or claims exclusions if applicable. Scoring is performance-based at the individual measure level, for a total of up to 100 points. In 2019, organizations must use the 2015 Edition CEHRT. Clinicians and groups considered non-patient facing, and practices with 15 or fewer eligible providers and/or clinicians practicing in rural and health professional shortage areas, may face reduced reporting requirements. Watch the video below to learn more. SurveyVitals can help anesthesia clients who utilize a Qualified Clinical Data Registry (QCDR) meet a measure–AQI 48 (anesthesia patient experience)–in the Quality performance category. We currently support NACOR (Anesthesia Quality Institute), Anesthesia Business Group, Anesthesia Quality Registry (ePreop), and MiraMed (Anesthesia Business Consultants). Learn more here. What are the current MIPS deadlines? 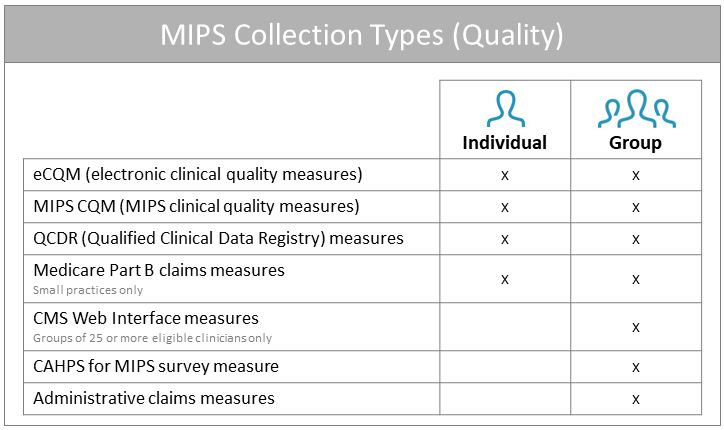 How is MIPS different in 2019? To learn about the changes from year 2 (2018) to year 3 (2019) of the MIPS program, see our article on the 2019 updates. Does SurveyVitals administer CAHPS for MIPS? Yes! SurveyVitals is a CMS-approved vendor ready to administer CAHPS for MIPS on behalf of your organization in 2019. The CAHPS for MIPS survey can be used to satisfy one Quality measure or one Improvement Activity. 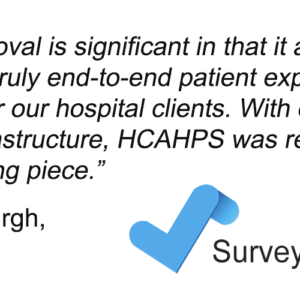 Contact us at info@surveyvitals.com to learn more about our CAHPS program. Interested in meeting measures with SurveyVitals? Want to learn how SurveyVitals can help you prepare for MIPS? Subscribe to our MIPS update list below or email us at support@surveyvitals.com. You can also send us a message using the blue chat icon below to speak to a member of our support team. *Note: Information and program details are based solely upon SurveyVitals’ experience with MACRA and our interpretation of CMS rule-making and policy statements. The information presented does not reflect the views or policies of CMS or any other governmental agency and is not to be construed as practice management advice. The patient experience is improving because of your dedication. Here are some remarkable metrics you were a part of in 2018. 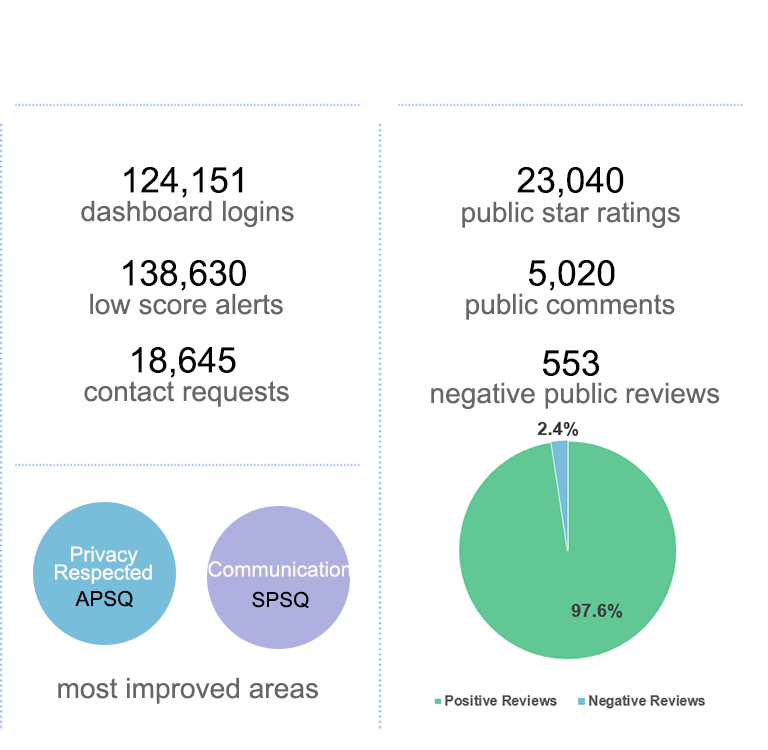 Over 2 million surveys were completed last year, providing feedback on more than 31 million questions and bringing in over 2 million comments. Patient comments were overwhelmingly positive–there were 57 positive words for every one negative word! Patients aged 64-75 years old were the best respondents, with the highest response rates for email, SMS, and overall. The most satisfied patients were males 25-34 years old for APSQ, and females 65-74 years old for SPSQ. Our clients logged in over 124,000 times last year and received 138,000 low score alerts and 18,000 contact requests. This helped drive improvement in every area of care, but the most improved areas were Privacy Respected for APSQ and Communication for SPSQ. Thank you for working with SurveyVitals to help your patients and your organization. We look forward to helping you continue to meet your patient experience goals in 2019! 2018 was an outstanding year for SurveyVitals and our clients. We launched a new and improved portal, released additional product features, and brought in over 2 million surveys! As we head into 2019, we’re looking at revamping some existing features and adding new resources that will help our clients get the most out of the solution and meet their improvement goals. Let’s look at some of the things we have in store for the coming year. We’ve redesigned our custom reporting tool with improved benchmarks and better usability. More selections, new filters, deeper comment analysis, and better care team representation provide a faster, more intuitive, and more comprehensive look at your performance data. 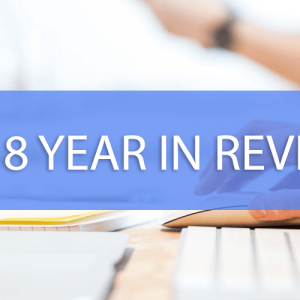 In 2018 we introduced the Public Review feature, which drives higher volumes of online reviews from verified patients and helps increase the online presence and reputation of our clients. In 2019 we will continue to focus on enhancing Public Review to provide optimal benefits to our users and give them the ultimate competitive advantage. Address patient concerns on the spot with our new Point of Care Tool. Enter minimal patient information into a user-friendly interface and administer a patient survey within seconds. Patients use their own devices and feedback is instant, saving on hardware costs and time. We want to support our clients’ improvement efforts and help them utilize the solution to its fullest potential. From videos to articles to quick tips and best practices, we’ll be creating resources and libraries to help our clients every step of the way. In 2019, we’re helping you to improve along the whole continuum of care with the Patient Reported Outcomes Survey. This survey, along with the Global Surgical Outcomes Survey, aims to identify gaps in care and reveal opportunities to improve patient outcomes. Email us at support@surveyvitals.com to learn more and get started. Our solution is built on client feedback. What do you hope to see from us in 2019? Email us at support@surveyvitals.com and let us know! Celebrate National Healthcare Quality Week with SurveyVitals! October 21-27 is National Healthcare Quality Week. This week is dedicated by the National Association for Healthcare Quality to celebrating the contributions professionals have made to improve healthcare quality. At SurveyVitals, we understand the value of improving patient safety and outcomes, performance and process improvement, and utilizing data analysis to drive improvement. In fact, these are the things that have shaped our solution. Since 2002, we have built into our system tools and features that help our clients make data-driven decisions to provide the highest quality of care to their patients. We have worked with industry experts and listened to the needs of our clients to be sure our solution helps achieve quality improvement goals. We want to thank all of our clients for your hard work in providing a higher quality of care and better patient experience. Did you know there are a few ways you can celebrate with SurveyVitals? Recognize top performers with SurveyVitals’ Friday kudos emails (SPSQ only), which spotlight weekly top performing staff members in your organization. Celebrate your organization’s Top 10% Awards. These awards represent exceptional work toward higher healthcare quality and deserve special recognition! Top 10% Awards are awarded quarterly and annually to practices who rank in the top 10% for composite score for APSQ and SPSQ surveys. Try out Challenge Mode in your portal. Issue a challenge to providers in your organization in any questions or question areas. Offer special recognition for whoever tops the leaderboard. Nothing encourages a higher quality of care quite like a bit of friendly competition! Enroll providers in bi-weekly positive kudos emails. Share your verified ratings online! With the new Public Review feature, you can proudly display verified patient ratings and comments to show the community the level of care you provide. How does your organization plan on celebrating National Healthcare Quality Week? Clinician types that were eligible to participate in 2018 remain in the program for the 2019 performance year. Clinicians and groups would have the choice to opt-in to MIPS if they met or exceeded one or two, but not all three, of the low-volume threshold criterion. Individual clinicians would be able to submit a single measure via multiple collection types, such as MIPS CQM, eCQM, QCDR measures and Medicare Part B claims measures. They would be scored on the data submission with the greatest number of measure achievement points. Additionally, groups and virtual groups would be able to use multiple collection types. Those are some key takeaways for what to expect heading into year 3. A full breakdown of each proposed MIPS changes can be found in the table below. CMS is currently accepting feedback on the proposed rule at regulations.gov. The 60-day comment period will end on September 10, 2018. It is expected CMS will release the final rule in late fall. Check the SurveyVitals blog for updates or subscribe to our MIPS list here. For more information about how SurveyVitals can help you complete your MIPS requirements, email us at info@surveyvitals.com or sign up for a quick overview. Also feel free to chat with us using the blue chat icon in the bottom-right corner of your screen at anytime. To be excluded from MIPS, clinicians and groups must meet one of the following two criterion: have ≤ $90K in Part B allowed charges for covered professional services OR provide care to ≤ 200 beneficiaries. Beginning with 2019 the virtual group eligibility determination period aligns with the first segment of data analysis under the MIPS eligibility determination period. Groups and Virtual Groups would be able to use multiple collection types. However, the Bipartisan Budget Act of 2018 delayed consideration of improvement in the Cost performance category until the 2024 payment year (based on the 2022 performance year). As a result, there will be no improvement scoring in Year 2 MIPS payment year. 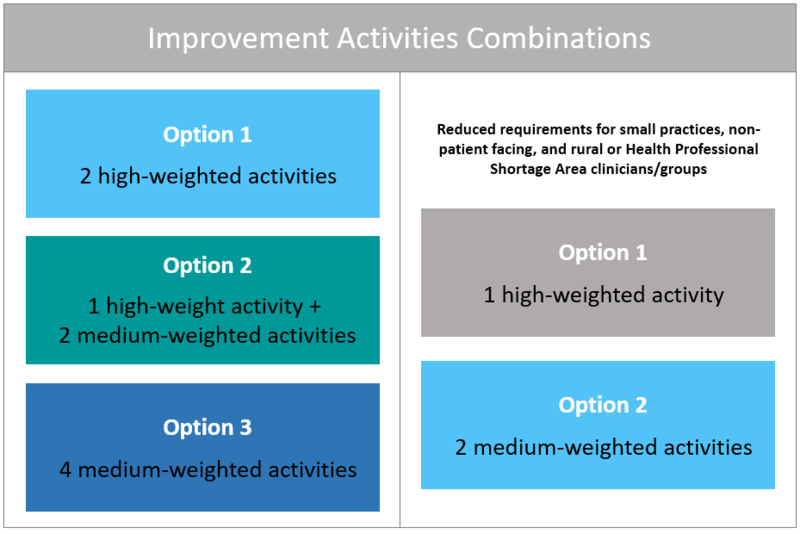 Two measure set options for reporting based on the clinician’s CEHRT edition (either 2014 or 2015). *The contents of this table were originally published by CMS in the Proposed Rule for the Quality Payment Program Year 3. 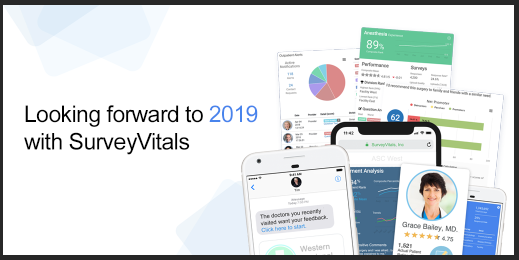 BOISE, ID (Press Release) – SurveyVitals, Inc., a healthcare analytics company specializing in digital patient experience surveys, announced their approval by the Centers for Medicaid and Medicare Services (CMS) to administer the HCAHPS survey. The company becomes one of only 28 certified vendors in the nation. Hospitals are required to administer the HCAHPS survey as a part of the federal Value Based Purchasing program, which is a determinant of Medicare reimbursement. CMS also assigns hospitals a public star rating using HCAHPS survey results as a part of its consumer-facing initiative, Hospital Compare. In addition to HCAHPS, SurveyVitals is certified to administer the Merit-Based Incentive Payment System CAHPS (CAHPS for MIPS) , Accountable Care Organization CAHPS (ACO CAHPS), Outpatient and Ambulatory Surgery CAHPS (OAS CAHPS), Hospice CAHPS, Home-Health CAHPS (HHCAHPS), In-Center Hemodialysis CAHPS (ICH CAHPS), and Patient-Centered Medical Home CAHPS (CAHPS PCMH). CAHPS is a program and registered trademark of the U.S. Agency for Healthcare Research and Quality. SurveyVitals inspires positive change in healthcare by providing real-time, actionable patient feedback to providers and organizations through innovative technology. With intuitive, in-depth reporting via online client portals, SurveyVitals provides the tools needed to succeed in today’s rapidly changing healthcare landscape. The solution supports more than 16,000 providers operating across 85 specialties. Interested in learning more about SurveyVitals? Request more information or schedule a free, no-obligation demo here or call us at 972-442-1484. Unverified online patient reviews do not always correlate with actual patient experience, according to a new study published by the Mayo Clinic. Can you trust what people say about doctors online? That’s the question that researchers from the Mayo Clinic set out to answer when they started collecting data from online patient reviews in 2014. The results of the study, which were released in the April edition of the Mayo Clinic Proceedings, corroborate what physicians have been saying for a long time: Unverified online reviews often present an inaccurate depiction of physicians and their practices. Researchers collected online patient reviews for two groups: 113 physicians who had received at least one negative online review (<50% of possible score), and 113 physicians who had never received any negative online reviews. The researchers then tracked these physicians’ performance over the next several months using verified, tested patient satisfaction surveys. (similar to SurveyVitals’ 360° Survey Solution). After analyzing the verified patient satisfaction scores, the results were clear: There was no correlation between negative online reviews and patient satisfaction scores. No, you can’t always trust what people are saying about doctors online. In the digital age, online reputation is paramount to success. Not sure about that? Check out this study that found 54% of millenials look online before choosing a doctor. 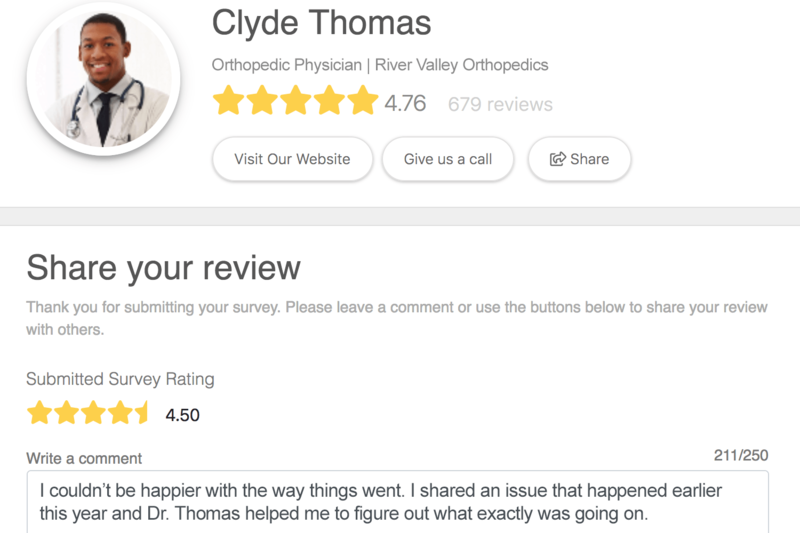 Online reviews can create a ripple effect that impacts everything from choosing a doctor to perception of care received. As patients approach healthcare with an evolving consumer mindset, and as the healthcare industry shifts toward a pay for performance model, negative perceptions will inevitably damage an organization’s bottom line. The unsettling part is that in most cases anyone can go online and write these reviews, regardless of whether or not they’ve ever interacted with the physician. This exacerbates the problem that the loudest voices on the internet tend to be the most upset, creating an unbalanced portrayal that isn’t necessarily representative of a practice’s entire patient population. The best way to protect your organization’s online reputation is to share your verified patient ratings with the world. SurveyVitals’ Provider Widget is the easiest way to share and promote your verified reviews. The Provider Widget displays actual feedback from actual patients. Instead of unreliable, unverified reviews from strangers on the internet, the Provider Widget automatically gathers data from the patient population as they submit their patient experience surveys. Ultimately, the verified reviews give patients the confidence they need in choosing a provider to treat them. SurveyVitals’ Provider Widget shows ratings from not just a few, but often from thousands of verified patient to generate a trustworthy source of information. Harnessing the power of actual patient ratings creates a competitive advantage against peers who rely on unverified reviews. Patients who see the ratings on the Provider Widget know that they are getting an accurate representation of their provider’s performance. How to set up the Provider Widget. 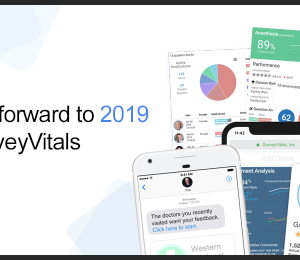 If you aren’t currently utilizing the SurveyVitals solution, schedule a demo to learn more about how SurveyVitals can help your organization with patient experience surveys, CAHPS surveys, MIPS Improvement Activities, the Provider Widget, and more. If you are already running the SurveyVitals solution, please contact your support team or email support@surveyvitals for help setting up your widget. By providing the information and tools to help people make informed decisions, we can work toward making a better healthcare systems for both physicians and providers. Better insights can lead to better outcomes for everyone involved. On January 2, the Centers for Medicare and Medicaid (CMS) launched a new data submission system for groups and clinicians participating in the Quality Payment Program. Clinicians now submit all their 2017 performance data in the same place. Previously, under the various CMS legacy programs, clinicians had to use multiple mechanisms to submit performance data. 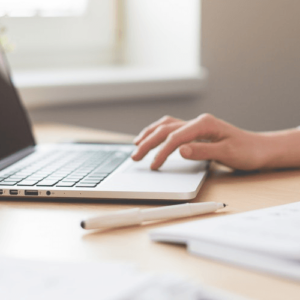 CMS has now consolidated the data submission process to a single access point via an online portal, making it easier for clinicians and vendors to submit data. The submission period for the 2017 QPP performance year runs from January 2, 2018, to March 31, 2018. For groups using the CMS Web Interface, the submission period runs from January 22, 2018 to March 16, 2018. How to submit performance data? To submit performance data, clinicians must visit the QPP website. Once on the QPP website, users can login by entering their EIDM User ID and password. Users may have used this ID and password in the past to login to the CMS Enterprise Portal. If you don’t have an EIDM User ID and password, you can create an account on the CMS Enterprise website. In the portal, clinicians have the option to choose between multiple data submission options, including Qualified Clinical Data Registries (QCDRs), qualified registries, attestation, or the CMS Web Interface. Data can be uploaded incrementally throughout the submission period. Groups and clinicians are not required to upload all of their data at once. However, all performance data must be uploaded before the submission period deadline. For Merit-based Incentive Payment System (MIPS) participants, real-time initial scoring updates will appear as performance data is tallied on the site. This scoring may change as new data is uploaded, or if new benchmarks take effect. Note that special status, Alternative Payment Model (APM) status, and Qualifying APM Participant status (QP), will not initially appear in each category score. Final scores will appear after the submission period closes. For more information about the Quality Payment Program, see our guide. An important deadline is approaching for groups and physicians participating in MIPS in 2018. 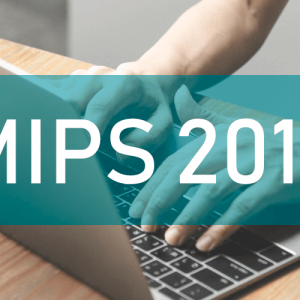 December 31 marks the last day for clinicians to notify CMS that they are electing to participate in a Virtual Group for MIPS 2018. If you aren’t familiar with Virtual Groups, you aren’t alone. 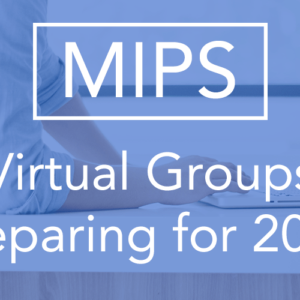 Virtual Groups are a brand new option for MIPS participants in 2018 (Just one of several changes that CMS is implementing – check the details in this blog post). These Virtual Groups allow clinicians from around the country to team up with each other to help satisfy MIPS requirements. To help groups and clinicians prepare to participate in a Virtual Group in 2018, we have compiled some FAQ about the program from the final rule published by CMS. A Virtual Group is defined as a combination of two or more TINs assigned to one or more solo practitioners or one or more groups consisting of 10 or fewer eligible clinicians that elect to form a virtual group for a performance period for a year. There is currently no limit on the number of TINs that can participate in a virtual group (i.e. one provider might have multiple TINs from multiple practice locations and can form a virtual group as a solo practitioner). Virtual Groups have the flexibility to work with other groups or types of practices from any location. This could open the door for more clinicians to join the program and work with their peers, regardless of their geographical proximity. What is the deadline to notify CMS about a Virtual Group? Individual MIPS eligible clinicians or groups electing to be in a Virtual Group must make their election prior to the start of the applicable performance period and cannot change their election during the performance period. The deadline for such an election was recently extended to December 31, 2017. Can me or my group participate in multiple Virtual Groups? No. Each eligible clinician or group may only elect to be in one Virtual Group at a time. In the case of a group, the election applies to all MIPS eligible clinicians (NPIs) in the group. How are Virtual Groups identified for reporting purposes? Each MIPS eligible clinician who is part of a Virtual Group will be identified by a unique Virtual Group participant identifier. This unique identifier is composed of a combination of the following identifiers: 1) Virtual Group identifier (established by CMS) 2) TIN number and 3) NPI number. Are there different reporting requirements for Virtual Groups? Virtual Groups have the same reporting requirements as other MIPS participants. There are still special exceptions for non-patient facing practices, small practices, rural practices, and practices with HSPA status. For the most part, policies that apply to regular group reporting also apply to virtual group reporting. What are the steps to form a Virtual Group? 3. Submitting formal election registration – On behalf of the virtual group, the official designated virtual group representative must submit an election by December 31, 2017. – Such an election will occur via email to the Quality Payment Program Service Center using the following email address: MIPS_VirtualGroups@cms.hhs.gov – Submission must include, at a minimum, information pertaining to each TIN and NPI associated with the virtual group and contact information for the virtual group representative. – Each TIN associated w/the virtual group – Each NPI associated with the virtual group – Name of the virtual group representative – Affiliation of the virtual group representative to the virtual group – Contact information for the virtual group representative – Confirmation through acknowledgement that a formal written agreement has been established between each member of the virtual group (solo practitioner or group) prior to election and each eligible clinician is aware of participating in a MIPS virtual group for an applicable performance period. – Each party must retain a copy of the virtual groups written agreement and is subject to the MIPS data validation and audit process. If approved to participate in a virtual group, CMS will contact your group representative via email to notify them of their status and issue a virtual group identifier for performance. How to formally elect to participate in a Virtual Group? CMS released a Virtual Group Toolkit to get started with the election process. It can be downloaded here. Can SurveyVitals help meet MIPS requirements? Yes! SurveyVitals is a CMS-certified CAHPS vendor ready to administer CAHPS for MIPS. Additionally, SurveyVitals can help organizations meet 6 different Improvement Activities to satisfy MIPS requirements. And if you are an anesthesiologist, we can also help you meet a measure in the Quality Category via QCDR reporting. Schedule a demo today to learn more about how SurveyVitals can help with MIPS in 2018. Given the flexibility of the MIPS program this year, it would be a missed opportunity for groups and clinicians to submit just 90-days of performance data to Medicare to earn a moderate positive payment adjustment – maybe even the max adjustment – in 2019. Learn more about MIPS and “Pick Your Pace” here. While it might seem a bit daunting if you haven’t started, there is still a short window of time for you and/or your group to select the required number of measures and get up and running before the partial submission deadline passes. 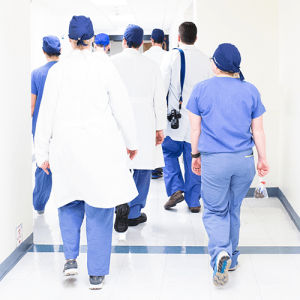 For clinicians in rural or health professional shortage areas, or for those clinicians considered non-patient facing or “hospital-based,” you may face reduced reporting requirements. Learn more about these special status groups under MIPS here. Submission methods may vary based on the measure.